I hope you had a fantastic Thanksgiving and if you're brave (ie crazy) enough to face the Black Friday sales today I wish you luck! I started off by stamping my tree in versamark ink on a piece of white card stock and embossing it with clear embossing powder. I stamped the dots around the tree in versamark and embossed them with gold embossing powder. I cut a quick mask to cover up the ornaments on the tree from some masking paper and also cut half inch strips of masking paper to mask off the borders of my cardstock and then inked it up with an ink blending tool and some Picked Raspberry Distress Ink. Once that was done, I removed the masks and colored in the ornaments with Copic Markers and the added some Wink of Stella shimmer and glossy accents on top of each ornament. I die cut the word Sparkle from Hawaiian Shores Cardstock three times and glued them on top of each other to make a nice thick die cut word. I added some shimmer and glossy accents to that and set it aside to dry. I stamped the rest of my sentiment in black ink and added some baker's twine to the top of the panel - quick baker's twine tip: If you're using a baker's twine with metallic thread any cut ends can unravel really easily and look a little messy, if you dab on a little bit of multi medium matte on the end and twist it with your fingers it stays perfectly neat and tidy! I adhered the Sparkle die cut when it was dry and then adhered the whole thing to a Hawaiian Shores card base with foam adhesive. Wow! This is stunning! Totally captured the spirit of the inspiration piece! Wow! What a stunning card, its gorgeous! Hope your dream comes true! What a great card design! love the glitter around your tree and the fun die cut sentiment! Gorgeous beauty, Becky! 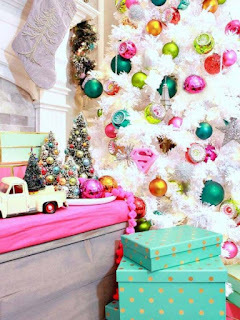 Love to have a girly tree, too! Hopefully you will! Hugs! WOW!! your take on the photo is spot on! 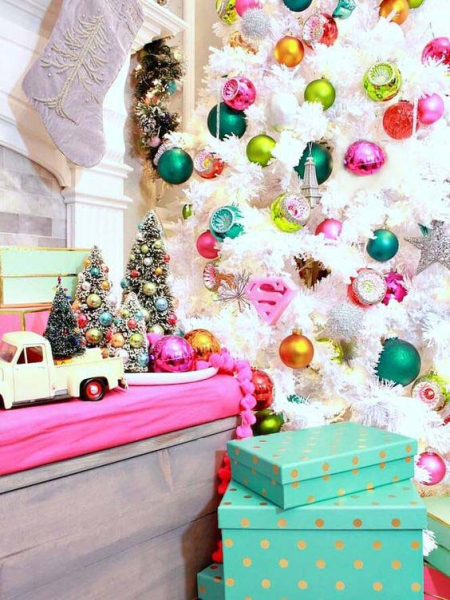 This is the perfect girly tree! I could definitely have one like this in my home! Adorable card and great take with the inspiration picture. So bright and cheerful ! GORGEOUS!! Yes, I'm shouting :) I absolutely love your pink background and stunning white tree! This is fabulous! Love that pretty white tree and that awesome inked backdrop. Great take on the inspiration photo! Beautiful! That tree really stands out. Beautifully done! Great look and design!